This page will show you the basics of using GPS Visualizer's "data" form to create maps of quantitative data. Please feel free to get in touch with any questions you might have about the topics listed below. GPS Visualizer's map input form for quantitive data contains some options not found in the other map forms: notably, the ability to resize and colorize points based on any field in your data. For illustrative purposes, let's use the sample data from the Waypoints Tutorial, but we'll add another plottable field to our volcano data: age of last eruption. And, for the sake of keeping it simple, let's remove the description. 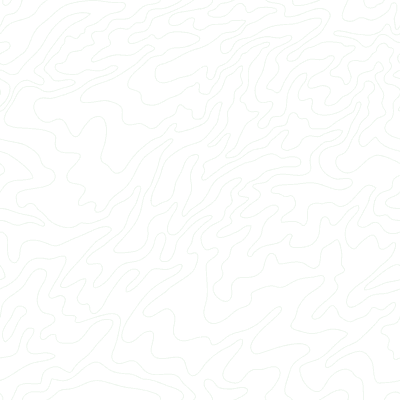 To get a map like this, specify "altitude/elevation" for "Colorize points by..." on the data form. We haven't done anything with the "age of last eruption" field yet. 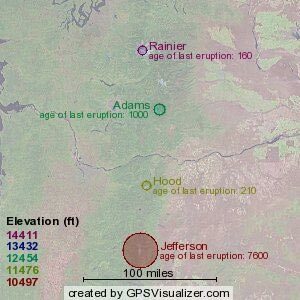 To get this map, leave the "Colorize points" setting on "altitude/elevation," but change the "Resize" setting to "custom field" and enter "age of last eruption" in the "Custom resizing field" box that appears. Now we're mapping in four dimensions: latitude & longitude (shown by the position on the map), altitude (red is the lowest altitude, purple is the highest), and age of last eruption (smaller circles indicate smaller ages). By the way, if you think it would make more sense to have volcanoes with more recent eruptive activity get larger circles, you could use negative numbers for the ages. Note that the default resizing parameter, when you first load GPS Visualizer's data form, is "N". The letter N is typically used to represent the size of a sample... so if, for example, you have a list of ZIP codes and how many customers are in each ZIP code, you can name the frequency column "N", and GPS Visualizer will take it from there (if you call that column something else, you can stil use it, but you have to tell GPS Visualizer you're using a custom field name). And you do not need to geocode your ZIP codes first. But sometimes, you might not have a count of how many people are in each ZIP code; instead, you just have a list of codes, where each one appears multiple times. To get the N, one solution would be to create a PivotTable in Excel, but frankly PivotTables are not very user-friendly. Instead, you can just give GPS Visualizer the raw list and have it count up how many times each ZIP code appears. To do this, enable the option in the input form labeled "Calculate frequency," and choose N/Frequency as your resizing or colorizing parameter. ...because GPS Visualizer automatically finds the coordinates of postal codes. Frequency calculation (and built-in geocoding) works with many types of locations: ZIP codes, Canadian postal codes, city/state pairs, states, countries, and U.S. counties. Postal codes and simple state abbreviations work best, though, because there's little margin for error with such rigidly-defined data types. Note that for U.S. and Canadian postal codes, you can also supply just the first 3 digits/letters (e.g., 972 instead of 97214); this can make for a broader summary and a less-messy map -- but you'll have to truncate your own codes before sending them to GPS Visualizer. The "Automatic" frequency calculation option should work for most purposes -- but please note that if you have other fields in your data -- such as "name," "color," etc., they may interfere with the process, because every point that is unique in any way will be plotted. Raw single-column lists work best.